HP Employees can be heroes too! Be a hero for The Hero Initiative and sign up beginning Nov. 3rd, 2008 for the HP Charitable Giving Campaign and have HP match your cash donations to the Hero Initiative up to $1,000 annually. 5) Tax receipts are not available on the GivingStation because neither the GivingStation nor HP are charities. However, both organizations combined do provide sufficient information for gifts made via payroll. Use your GivingStation Pledge Confirmation and your HP Earnings Statement. HP instructs charities to receipt employees directly upon every distribution. The Hero Initiative thanks you for your support! Good news, Green-o-philes! 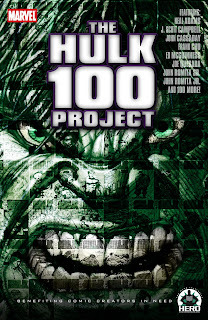 The Hulk 100 Project, originally advertised and solicited at 128 pages, was full to burstin', so we upped it a tad to 136 pages! And it's still the same ol' $10. If you don't truck to your favorite comic store immediately and reserve a copy, well…then you're just a fuddy-duddy. 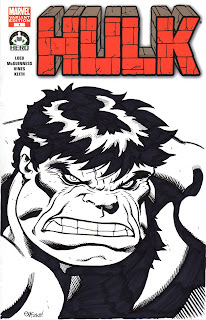 We have only three original Hulk covers left, and will be looking to auction ’em off (along with what I believe will be an unexpected surprise!) on or about November 3. Meantime, whet your appitites on two of the three remaining, from Erudite Ed McGuinness, and Captivating Cully Hamner! Phil Hester will be Hero's special guest at the upcoming Wizard World Texas con, and you can get a super-cool Hester-drawn Darkness #7 WWTX exclusive at the con. More info here. The guys at Mid-Ohio con are about he nicest folks you'll find. 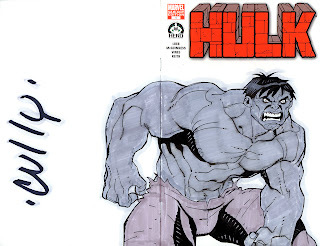 There's an auction of post-con stuff now benefiting both The Hero Initiative and the Make-A-Wish Foundation. Eat it up like candy. For it is sweet. 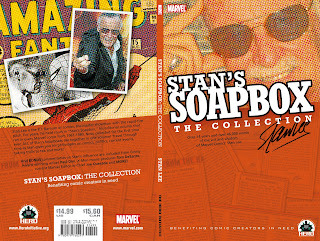 Stan's Soapbox: The Collection, our 144-page tome collecting ALL Stan Lee's kickass "Soapboxes" from 1967-1980, will be in stores on November 19. It's available in softcover at $14.99. Or, if you're more of a hardcover nature, please be advised: A special limited edition hardcover will be available at $35 as well. The hardcover is limited to ONLY 250 copies, so we suggest you preorder NOW at Atomic Comics. Or if ya like your books signed, a mere 100 of the 250 hardcovers will be available autographed by Stan the Man himself at $99 per. Eat ’em up like candy. 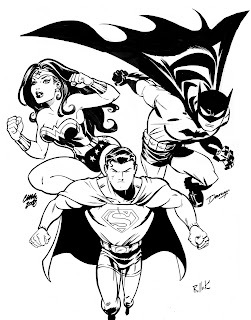 Collector Ron Sonenthal walked away with this super-cool Cameron Stewart-Darwyn Cooke-David Bullock Wonder Woman-Bats-and-Supes piece as part of one of our auctions at San Diego Comic Con this year. Moral to the story: You oughtta bid in our auctions.